Hettie makes traditional Welsh wholecloth quilts using a frame and talks about her favourite quilt made in 2006. She explains how she comes up with the designs for her quilts and how she transfers those designs to the fabric. 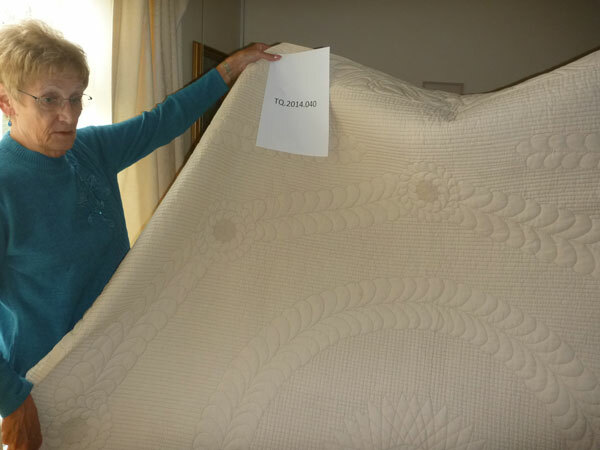 She also discusses the quilt groups she attends, where they make quilts using old large quilt frames, and explains why she thinks the stitching is the most important part of a good quilt. Binkie Thomas [BT]: I’ve explained everything about the Talking Quilts Project and we are just going to go straight into the interview. Right, Hettie can you tell me about your quilt? Hettie McCollum [HM]: I made it in 2006. 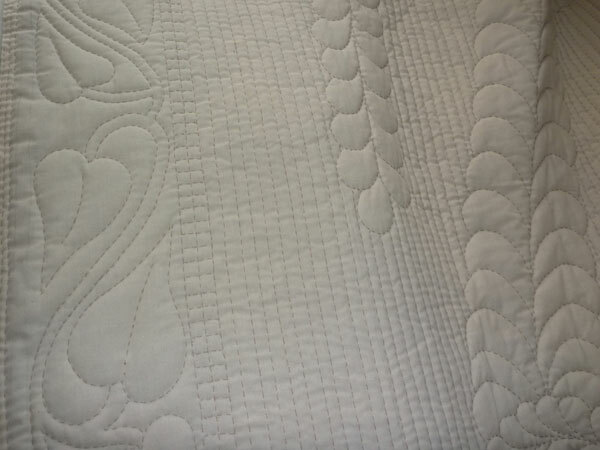 And it is more of a traditional type, a Welsh traditional type of quilt that one, I’ve done more modern ones, but these days you’ve got fine pencils, you can get a lot of detail now than you couldn’t get years ago so they’ve got a lot more intricate work on them. But I just started in the middle and worked out. I wanted feathers and they worked out very well, then I saw the stippling in the museum and then I thought I’d have a go at that so that went on there. But when I was sewing that I had cataract in both eyes. But I still managed, I was very short sighted, so I could sew, but I couldn’t see far away [Hettie laughs]. BT: So this is a wholecloth quilt. Could you just describe how, what sort of frame you used. HM: It’s a little plastic frame about 18 inches by 12. And you fit your quilt over it and snap the sides on and you can move it around as you go and it’s nice because it’s not like a full size frame, you can move it and turn it you can sit it on your lap and you can see the television and sew at the same time. BT: But I know that you use a different sort of frame. Can you describe the frames that you use in your group? HM: Oh the big frames, yes they are the old traditional Welsh frames. We’ve got one over there, I think it’s a hundred years old, but it’s full of woodworm now so something’s going to have to be done about that one [chuckles]. And we are working on it at the moment, and it must be at least a 100 years old, that the main thing. BT: That’s amazing. So what’s the colour of your quilt? [Another person talking in the background]. HM: Um trying to think what colour it was, cream and mocha I think it is, chocolate! BT: Lovely. [Same person talking in the background again].Right, I’m going to carry on now. [Talker apologises and BT tells them not to worry transcriber will sort it out] So how do you use the quilt? HM: Well I’ve got five that I made at home and they just go on the bed in turn. When they get a bit grubby they go in the bath for me to wash them. BT: How amazing. And how to you feel about the quilts? HM: Oh I like them. I think they’re fabulous. I like every one, but the one I brought today is my favourite. HM: Yes, I really like that one. BT: So when did you start making quilts? HM: I moved to Gilfach in, I think it was about 11 years ago, and I saw a little notice in the paper about the Welsh quilting class and I wondered what that was like because I had done patchwork before. And I went down to have a look and I’ve been going ever since. BT: Amazing. 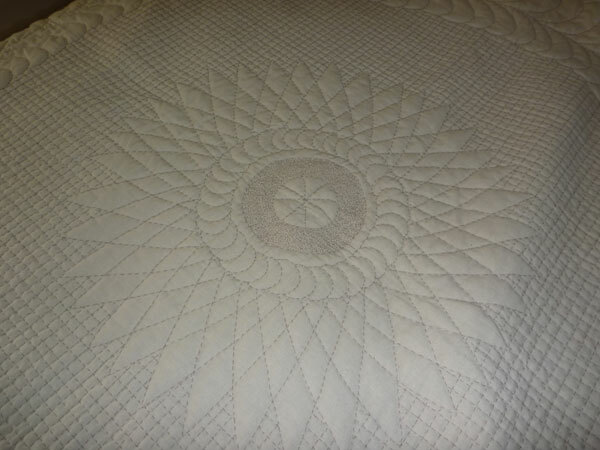 Are there other people in your family that make quilts? HM: One of my sister’s does. I think she belong to a group in Blackwood somewhere. [BT: Right.] She’s only just learning as well. I think she started, her husband died and she wanted to make a throw and she had some I think it was shirts of his. Lovely shirts, that she was… not good enough for a charity shop, but parts of them were too good to throw away so she used that, pieces of his shirts and made a nice throw with it and that’s how she started. BT: Ohh. That’s lovely. What are your preferred styles or techniques? HM: I think the styles I like are the old traditional ones, but I do like a bit of modern design as well, and the more intricate the better. BT: Do you incorporate them both? BT: How lovely. And what to you enjoy about quiltmaking? HM: I think it is so relaxing. I sends you to sleep though [chuckles]. We sew over there and we get to about teatime and you can see everybody slowing down and their heads are going and they start to fall asleep [BT chuckles]. It’s so relaxing, it really is. And it’s nice to sit… I’ve got to do something, I can’t just sit and watch television, so I sew and watch television as well. BT: Is there anything about quilting which you don’t enjoy? HM: Um… well if I make a quilt for somebody else, I have to give it away [HM laughs] and that I don’t like. But other than that, no. BT: Have you made many quilts to give away? HM: Um… About six I think, must be about six, yes. BT: Gosh. Do you use any technology when you’re quilting? HM: Um… I get pictures off the internet sometimes. I just take a photograph off the internet and I can make my template from that. [BT: Yes.] But that’s about all really. BT: Right. And where and when do you quilt? HM: Well I quilt once a week down there in the hall and every evening in front of the television. BT: Fab. And how do you go about making a quilt? 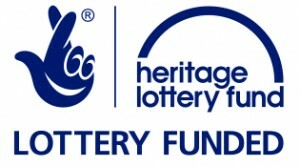 HM: I draw the design out first. Umm. When I start I decide fairly accurately what I want on it and make some templates and fit them all together, to see how they fit and then I draw that out onto a large sheet of lining paper and see how it all works and if that will fit in everywhere and if it looks okay and if it does then I draw it straight onto the quilt. BT: Right, gosh. Do you do it in a quarter of a quilt at a time or do you do the whole lot? HM: I start at the inside when I’ve got a nice centre I do that first, then I put the edging on and then work from the centre out to get it all filled in. and I sew it like that as well, I start it in the middle, just in case it moves and I don’t have a bulge anywhere [chuckles]. BT: Oh yes. So you spend a fair bit of time quilting, then. HM: Yes, I do really. [BT: Yes.] It’s such an enjoyable pastime. BT: I know [both laugh]. So what sort of, what do you spend your money on in quilting? What supplies do you buy? HM: Um… I buy cotton on the internet mainly, there are so few shops around now that you can get the right stuff. Templates I make myself. BT: What do you make them out of? HM: I make them out of plastic, cereal boxes, cardboard, whatever [chuckles], whatever I can find really. BT: Do you have a favourite shop on the internet? HM: Cotton Patch I think. It’s about the only one really. BT: So when you go and look at other people’s quilts, what do you look for in other people’s quilts? HM: I think it’s the stitching I look for first. I noticed when we went to the Museum I was looking for stitches more than… And then I stood back and looked at the design. But I like to look at a nice design as well, and see how they’ve fitted it all together. BT: Mmm… and what do you think makes a good quilt? HM: Well I think it’s the stitching, because that’s what holds it together after all, isn’t it and whether it will last or not depends on the stitching. So that’s the main thing really isn’t it? BT: Yes and where do you get your ideas and inspiration from? HM: Oh, fencing, peoples gates, ornate plaster ceilings, everything. Whenever I’m out somewhere I’ve got a camera with me and I take a picture of it otherwise I ‘m drawing little designs on a piece of paper. But no they come from everywhere. If I see a nice pattern, I think, ‘Oh that would look nice on a quilt’ and I take it home [chuckles]. BT: And how do you fell about hand and machine quilting? HM: I’ve never quilted on a machine. I think hand quilting is much better, it’s nicer and it’s much more pleasant to do. BT: Do you use a sewing machine? HM: Mmm. Yes, for other things. HM: Dressmaking, curtains, that sort of thing. BT: Right. So you’ve touched on the fact that you’ve made quilts and you’ve given them away, and you’ve got several at home and you’ve got them on the bed. 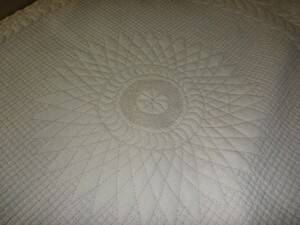 What is the biggest challenge today, a quilter faces do you think? HM: Finding materials mainly. And struggling to find a nice design, you’ve really got to work at that sometimes, and change it about three times as I’m going along and sometimes it will take about three months before it’s on the quilt. But finding a nice design is hard and you’ve got to have a good imagination I think. 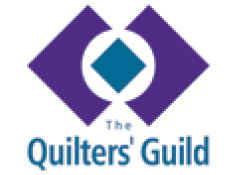 BT: Yes, and why is quiltmaking important in your life? HM: Because I enjoy it so much and I meet other people who like it as well. We seem to be all like-minded. We sit there chatting away, it’s a very sociable little group, it really is. BT: Well, I think I’ve come to the end of my questions. I am so thrilled to have met you. I think you belong to probably the only group of quilters In Wales that quilt on the old fashioned large frames. HM: That’s marvellous that is isn’t it? BT: I’m just amazed and it is so lovely to have met you. And for you to share your stories with The Talking Quilts Project, so thank you very much.